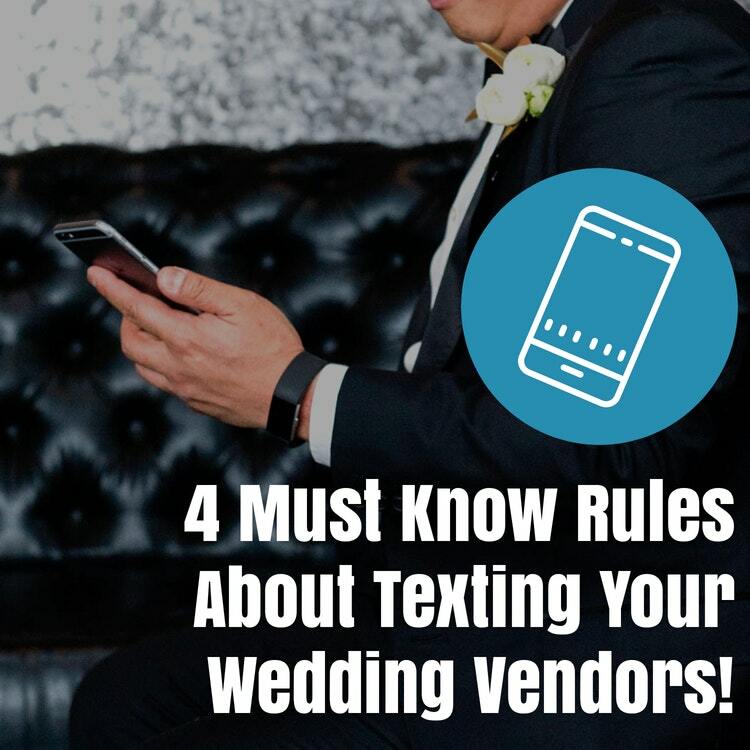 Four must know rules about texting your wedding vendors! Technology is a wonderful thing. It has allowed us to share with one another instantly and we almost always have a communication device on us at all times. However, that doesn’t necessarily mean we should use it in every situation. When it comes to communicating with your vendors, shooting them a quick text might seem like the easiest way to send a message, but, before you hit send, you should keep these four simple rules in mind! 1. Don’t text them the first time you contact them! For the first time you contact your wedding vendors, a text is probably not the way to go about it. I would suggest using the means available to you on their website or profile on any directory where you might find them. If texting is an option, sure, use it! But sending a blind text can have its drawbacks. You may not be able to give them all of the pertinent information they need to provide you with an accurate quote. They might not know who the message is coming from or not give it the same level of importance the would to, say, an inquiry from their website contact form. Talk to your vendors and ask them how they feel about you texting them. Some vendors might feel more comfortable with texting while other vendors, might find texting too difficult to send you the appropriate information you need. Be sure to ASK them if it is okay to text them. Texting your wedding day timeline or your photo shot list is just not plausible. There’s too much information. And it is too easy to delete a message and lose all that information. If you’re going to text your vendors, make sure it is for short messages, like letting them know you’ve arrived at the venue, or you’d like to set up a phone call. Use emails whenever you are going to have a lot of written information you might want to go back to later on. And use the phone if you need to have a discussion with some nuance to it or about topics that can easily be discussed in 30 seconds on the phone but might be difficult to describe via text. Remember that text messages aren’t very good at describing abstract concepts. 4. Be considerate of their schedule! While you might be up at 2 AM thinking about your wedding, it’s probably not a good time for you to be texting your wedding vendors. Talk to your vendors about what their regular office hours are, and stick to texting them during those times if you want a quick response. My rule of thumb for my clients is that I don’t reply to texts or phone calls after 7 PM, unless it is the week of your wedding when you can call/text any time of the day in case there is a wedding emergency.